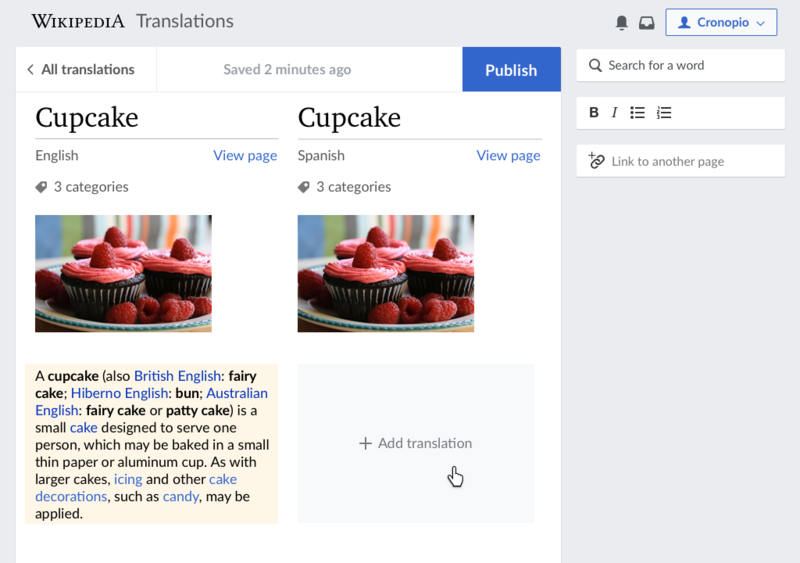 Content Translation allows editors to translate as much or as little as they want. Editors can add their paragraphs of choice to the translation. The translation is shown empty. When hovering an empty paragraph in the translation, an "Add translation" placeholder is shown. When hovering an empty paragraph in the translation or the corresponding one in the source text, the source paragraph gets highlighted in yellow. When clicking on an empty target paragraph (or the corresponding source paragraph), the paragraph is added to the translation. Initially, the content added will be a copy of the source paragraph (until machine translation support is added as part of other tickets). Initially when the translation is empty (and the user is not hovering any other paragraph in the translation), the invite to add a new translation will be shown for the first paragraph to communicate the starting point to the user. When clicking on a paragraph that is right after a heading, both the paragraph and the heading will be added to the translation. Pginer-WMF added a subtask: T188723: CX2: First paragraph gets added automatically to the translation on some articles. Everything else works as expected.